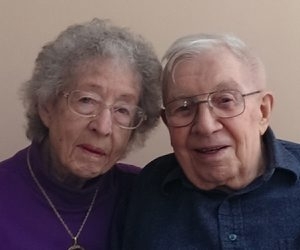 Mr. and Mrs. Norbert Adolf of Lancaster celebrated their 70th wedding anniversary with a party at the Protocol Restaurant and Bar in Williamsville. Mr. Adolf and the former Dorothy Guenther were married March 18, 1944, in St. Mary’s Church in Lancaster. He is a World War II Navy Seabees veteran. Mr. Adolf is a retired union carpenter for Acme Markets with 30 years of service and a retired volunteer firefighter for Protective Hose Company in Lancaster Village Fire Department with 70 years of service. They have a daughter, four grandchildren and six great-grandchildren.